A cloud copy ensures you can access your data from anywhere with an internet connection, while your local copy in AetherStore guarantees fast and easy access even without one. If you’ve ever taken a look at AetherStore’s pricing structure, you likely would have noticed that we offer a permanent free-tier that allows users up to 25GB of storage just for signing up for our product. Unfortunately, there aren’t many cloud backup solutions that offer this kind of freemium pricing structure, as most will offer a limited-day trial instead. These trials generally last around 7 to 30 days, which for most cases isn’t enough time to really experience and appreciate the utlity of cloud-backup services. Thankfully, with IDrive, you have a permanent 5GB freemium tier that you can test the waters with. 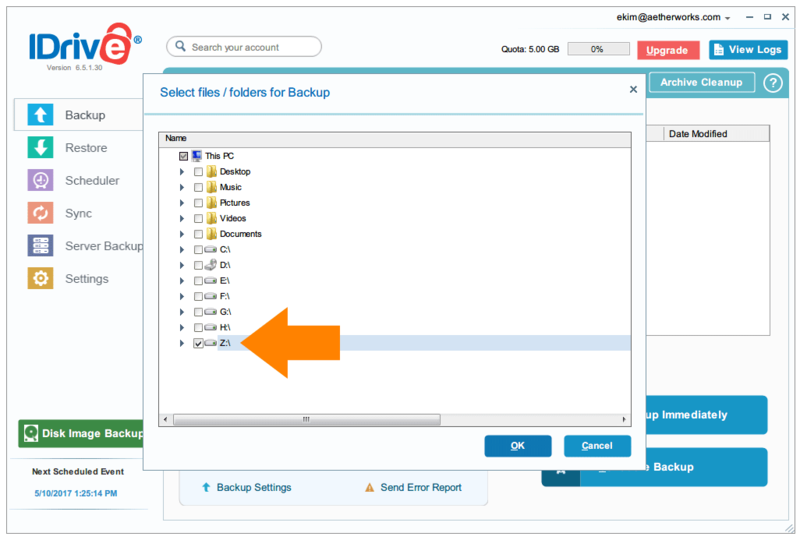 Admittedly it isn’t huge, but not everyone needs a huge cloud storage solution, and combined with AetherStore’s permanent free-tier, you have an indefinite amount of time to experiment with the 3-2-1 backup strategy before committing to a bigger decision. 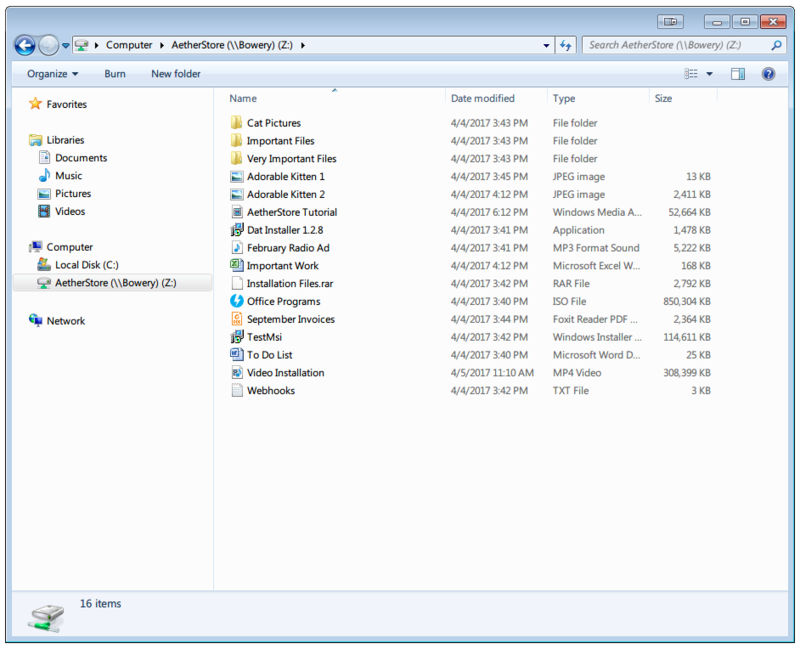 Below, I’ve outlined the steps to connecting AetherStore with IDrive so you can give the 3-2-1 backup plan a try if you haven’t gotten your feet wet yet. I already have my AetherStore set up, with all the files I need backed up sitting in there. Go ahead and do the same if you haven’t done so already. If you need help setting up your AetherStore, check out Shannon’s guide here. Install IDrive and run it. 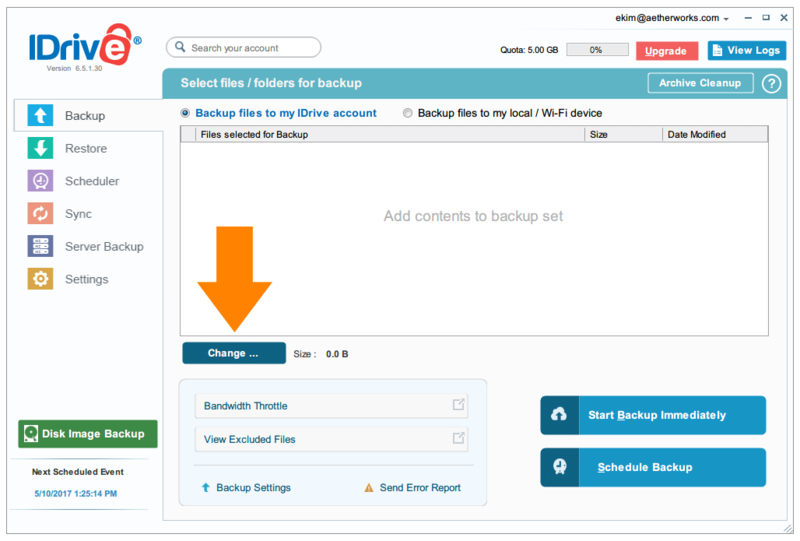 You’ll need to add a new location to backup, do so by clicking the ‘Change’ button. In the next window, select AetherStore as the backup location, then click ‘Ok’. 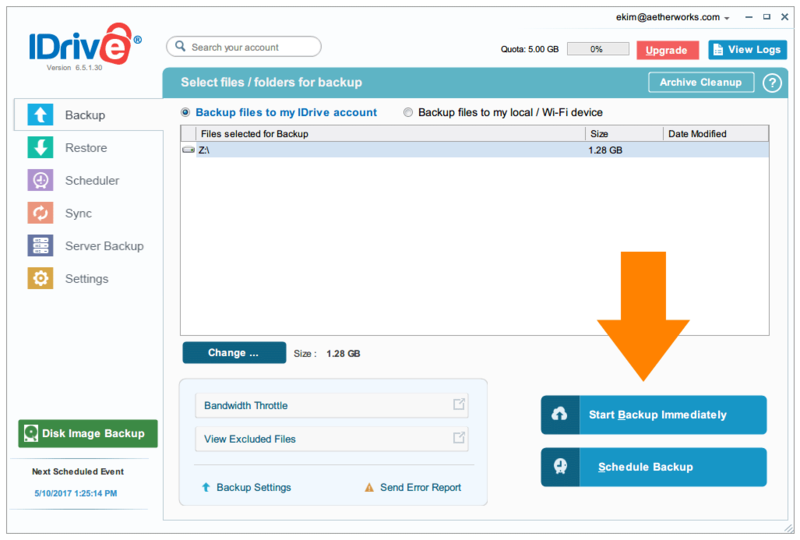 Now that you’ve set AetherStore as your backup location, click ‘Start Backup Immediately’ whenever you’re ready to proceed with your backups. 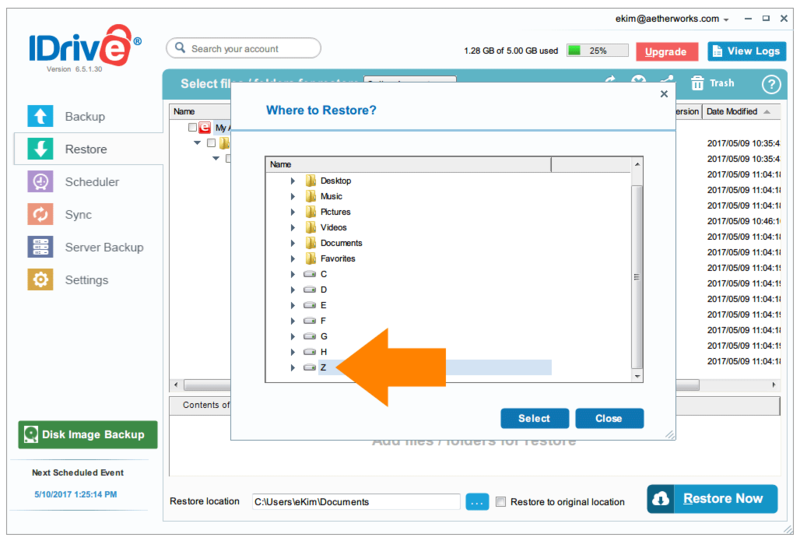 If you already happen to be a user of IDrive, note that the process can also go in reverse and is just as easy. 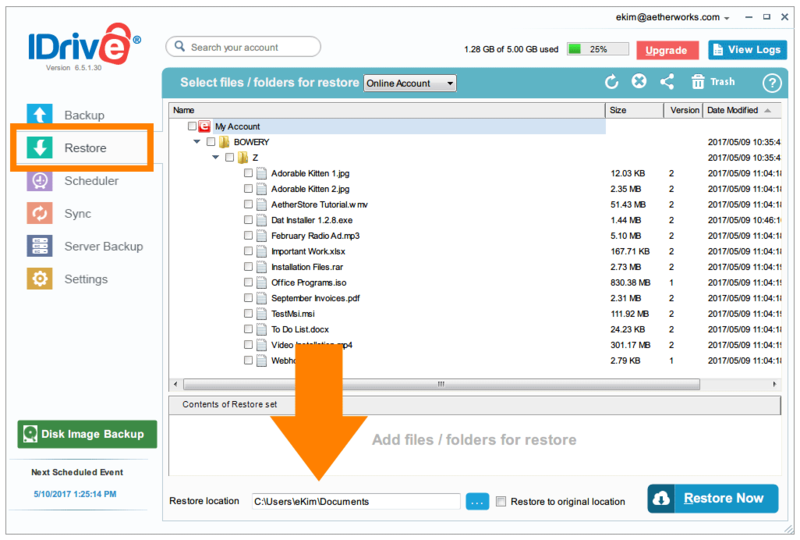 You can restore the backup files you already have in your IDrive directly into AetherStore, giving you encrypted, redundant, and self-replicating local copies of your backups. 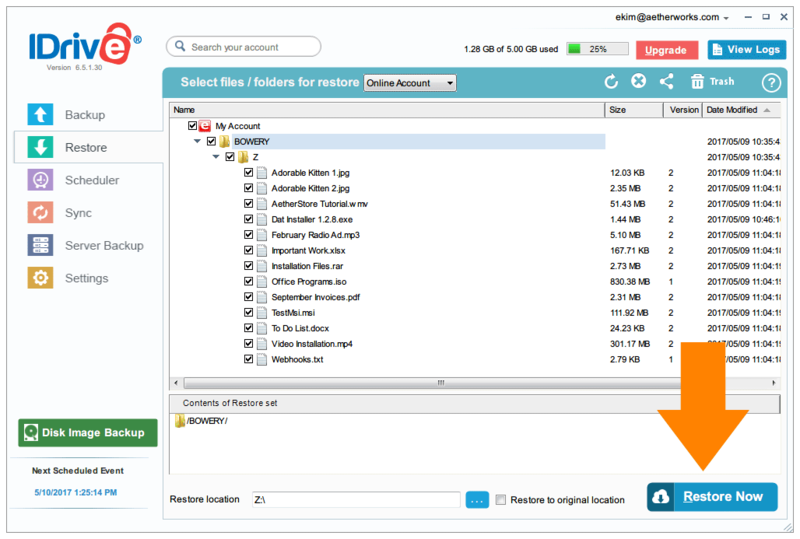 Open up IDrive and click the ‘Restore’ tab. You will be able to select the files that you want to restore to your machine. Afterwards, you’ll need to set your restore location. For me, the default location was set to My Documents, but you can change this by clicking the location the orange arrow is pointing at in the picture below. In the next window, select AetherStore as the restore location, and press ‘Ok’. Press the ‘Restore Now’ button to start the restore process. Pretty simple, huh? You’ve now successfully linked AetherStore and IDrive, giving you a setup that satisfies the 3-2-1 backup strategy criteria.